LAVENDER GARDEN Flower Arrangement in Cabot, AR - Petals & Plants, Inc.
Cabot FLORIST - Petals & Plants, Inc. 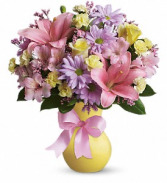 Celebrate inner beauty with this lush floral garden. 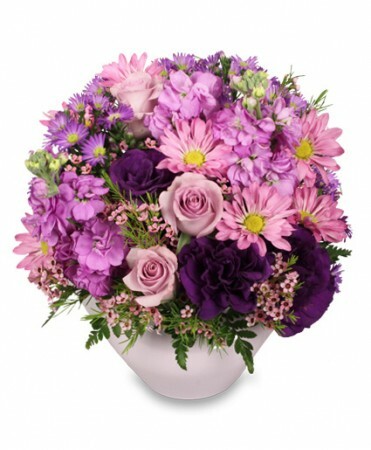 With a variety of purple daisies, roses, carnations and stock flowers gathered into a lavender bowl with leather leaf accents, these elegant blooms are the epitome of a regal garden. Crown the royalty in your life with this sweet and feminine garden of their own to admire! Pretty pastels and delicate flowers make this a feminine classic for your sister, friend or mother. 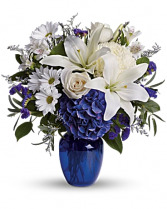 This beautiful bouquet pairs pure white flowers with deep blue blooms in a blue vase. Let the sun shine in! 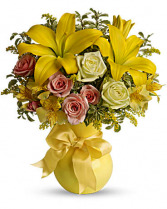 Warm yellow assortment presented in a lovely yellow vase that's tied with a yellow bow.